My paintings use the avenues of figure, still life and landscape to implant ordinary objects with psychological meanings. This group of paintings focuses on an implied human presence through depictions of collections of books. I begin the paintings by creating an installation of books, photographing it, and then painting from the photographs individually or collaged together. The books are often piled, jumbled, and stacked. 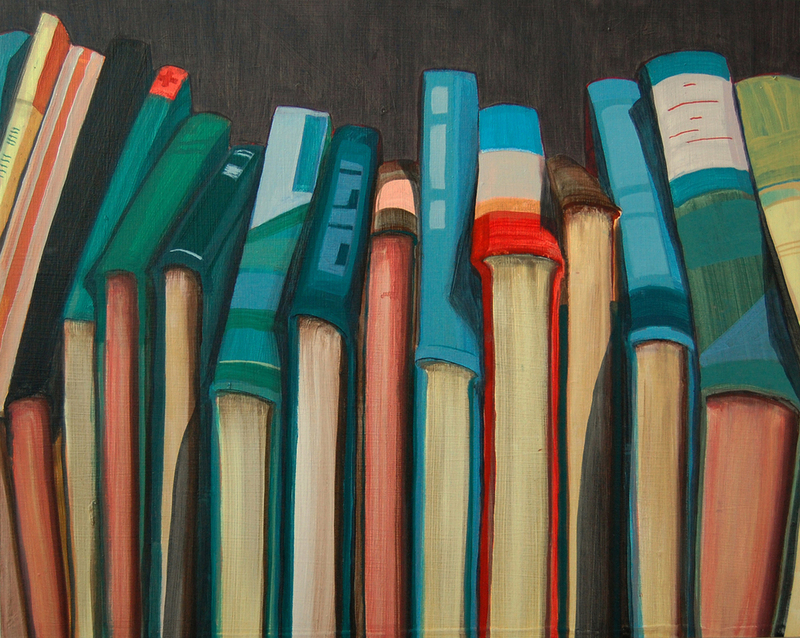 Through the act of painting, the arrangements become precarious, or the books larger than life- in each scenario the books are located just outside of reality. The text on the paintings is occasionally drawn from the original text on the books, but often is invented. These small groups of words steer the painting towards other meanings and offer hints at the content of the books. The closed (and occasionally blank) books have the potential to contain anything- primers, secrets, romances, how-to guides, theories, handbooks for improvement. They remain closed; impenetrable, or conversely, open to any possibility. The physical nature of the arrangement of books combined with the mutable meaning of the text places the paintings in the unsteady area between reality and invention. Jordan Buschur is an artist, educator and curator. She received an M.F.A. from Brooklyn College, the City University of New York. Her work has been shown internationally, including exhibitions with Thierry Goldberg Gallery, Vox Populi, and The Toledo Museum of Art. She was a community teaching resident at the Bemis Center for Contemporary Arts and completed residencies at Chashama North, the Kimmel Harding Nelson Center for the Arts and the Vermont Studio Center. Recent awards include the Kimmel Foundation Emerging Artist Award and the Charles Shaw Painting Award. Buschur is the Director of the Prescott Gallery and the Eisentrager-Howard Gallery at the University of Nebraska, Lincoln.